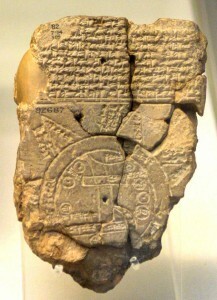 Simple sketches on clay tablets estimated to have been made around 600 BCE, have been found to be associated with ancient Babylonia. Egyptian maps were discovered that depict boundaries of their archaic empire. Beautifully etched maps from China showing trade routes delicately drawn on silk parchment, are all early admissions to the world of maps. By observing old maps, cartographers have found that most of the information recorded was placed in the center of the drawing. The outer edges were not filled in. This would indicate the distance that was acceptable when considering traveling from point to point. As we expanded our horizons, our legends expanded, too. The foundation of what might be more recognizable in terms of what we use today can be credited to the Greeks and Romans. They refined the art of map making. One of the more notable contributors was Claudius Ptolemaeus who lived in Roman Egypt. He was a mathematician, geographer and an astronomer. His famous work Geographia published in about 150AD was the first to use latitude and longitude lines. It referenced thousands of different geographical sites and revolutionized the way the world was seen through maps. It gave a mathematical viewpoint never before used to scale geographic distances. His work was a basic reference for hundreds of years, well into the 1500s. During the middle ages map making was done mostly in monasteries, and so they took on religious overtones. Elaborate drawings of angels and monsters decorated the scale, and the holy lands were often used to depict the center of the known world. Maps showing Jerusalem and the center of the world were not uncommon when produced by religious orders. A notable addition to map history was made during this time by an Arab gentleman named Al-Idrisi. While serving in the court of King Roger II of Sicily, Al-Idrisi composed a series of maps in a book entitled: The Amusement of Him Who Desires to Traverse the Earth. His works were impactful and held in high esteem for centuries. Jumping to modern day and contemporary map making; history, feet on the ground, space travel and satellite views, radar and sonar are all contributors to our knowledge of the Earth’s terrain and beyond. Map making is not a science of guessing or conjecture and longer. Cartographers are taking their skill into outer and outer realms where new discoveries are made daily. With the aid of space travel they are exploring and mapping parts of the Universe that their forerunners only used to guide them from village to village. Using the heavens to map our world has taken on an entirely different perspective and one their predecessors could only imagine. Through sonar maps are underwater terrain is being explored to depths unimaginable. There will never be a shortage of places to go and realms to map. Leave a comment below. Are you a cartographer or just have an interest in maps? I would enjoy hearing from you.